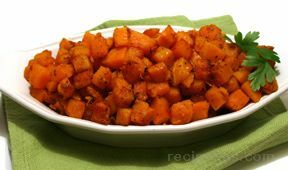 A touch of cinnamon and maple flavoring is just the right accent to this savory squash side dish. A perfect fall side dish for any meal. Cut squash in half crosswise and scrape out seeds. Place two halves cut side down in baking dish. 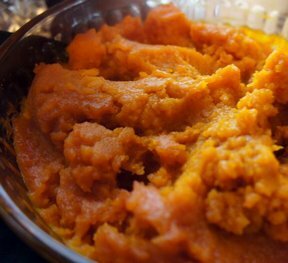 Cut several slits in the skin of the squash and the cook in the microwave or oven until tender when poked with a fork. Approximately an hour in the oven or 20 minutes in the microwave. When done, scrape the squash from the skin and place in a baking dish. Stir in the butter and maple syrup until butter is melted; then spread the squash out evenly in the dish. Mix cinnamon & sugar in amount desired. If 1 tbsp. of sugar & 1 tsp. 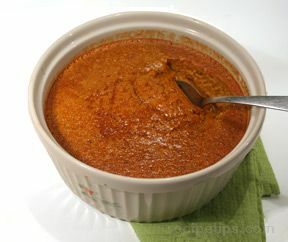 of cinnamon does not cover as desired, mix another batch. Sprinkle on top of the squash. Place in an oven preheated to 350 degrees F. Bake for 30 minutes or until squash is hot. "The squash had just a hint of maple and cinnamon flavor to it but it was just enough. It still let the flavor of the squash dominate the taste. 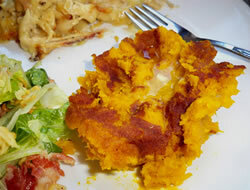 It was a nice change from just plain baked squash."